You might have read elsewhere on this site my warnings to avoid department store telescopes. Not only are the optics small and not good for showing you much, the telescope usually comes on a very flimsy tripod that won't keep the scope stable for aiming and viewing. Such telescopes have demoralized many would-be astronomers and caused them to run fleeing from the hobby. Perhaps you own one of these scopes. My advice is to return it to the store if possible or simply discard it, and buy a quality telescope from a dedicated telescope store. But let's say you are committed to making the best use of it. What can you do to make it usable? Ask any astronomer, and they will tell you that the eyepiece is half the telescope. The optics in the eyepiece focus the light from the lens or mirror into your eye; there are several designs available, each with its own special purpose. The eyepieces you get packed with department store scopes are, unfortunately, even lower quality than the scope itself. They are often mostly plastic, with optics that will give you fuzzy images. They have a very narrow field of view, so you get the feeling you're looking at the universe through a soda straw. And you have to place your eye very close to these eyepieces in order to see anything (this is called poor eye relief). These eyepieces are especially bad for people who wear eyeglasses. Some department store scope owners have told me their scope doesn't work at all - when in fact, they couldn't get their eye close enough to their eyepiece in order to see anything. The pack-in eyepieces are victims of cost-cutting in another way. Nearly all serious astronomical telescopes use standardized sizes for eyepieces. Most eyepieces have barrels 1.25 inches in diameter. This allows you to buy eyepieces from one manufacturer, and use them with scopes from another manufacturer. Larger scopes often have 2 inch focusers, which can accomodate eyepieces with 2-inch barrels (often low-magnification, wide-field eyepieces) or standard 1.25 inch eyepieces. Department store scopes have eyepieces that are 0.965 inches in diameter, presumably to cut costs. There are a few companies that make eyepieces in this size, but not many. You will enjoy the view much better if you purchase some third-party, 1.25 inch eyepieces for your scope. And the best part is that any 1.25 eyepieces you buy will also work with the next telescope you buy. And I do hope you will upgrade! In order to use a 1.25-inch eyepiece with the .965 focuser in your telescope, you will need a .965-to-1.25 inch adapter. You can purchase this adapter at nearly any telescope store. This will cost perhaps $15-$20. Next, you will want to purchase some quality eyepieces. The lowest you should expect to spend on a quality eyepiece is about $30. Really fancy eyepieces can cost hundreds of dollars each, even more. 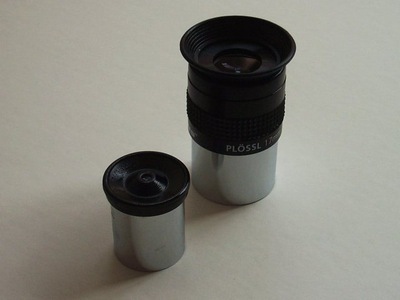 But for right now, just get some PlÃ¶ssl eyepieces. This design is well-regarded as the best all-around eyepiece. You can find good ones, from several manufacturers, for about $40-$60 at nearly any telescope shop. I recommend you buy one low-power eyepiece, about 25mm focal length, to help you find things with its wide field of view. Then, also get a high-power eyepiece, perhaps 10mm focal length, to help you view details on the Moon and planets. (The lower the focal length, the higher the magnification). Finally, if your budget permits, you might consider investing in a Barlow lens. This lens goes into the focuser before your eyepiece, and doubles the magnification of your eyepieces. Combined with the 25 and 10 mm PlÃ¶ssls, this gives you the equivalent of four eyepieces: 25mm and a barlowed 12.5mm equivalent, and 10mm with a barlowed 5mm equivalent. Telescopes often have another little tiny scope attached, called the finderscope. The finderscope shows you a larger region of the sky than the view you get through the main eyepiece. Its purpose is to help you locate objects in the sky. Unfortunately, the finderscopes provided with department store telescopes are difficult to use, and next to useless. Instead, pick up a red-dot finder to use with your scope. These finders (also called unit power or reflex finders) simply project a red ring or dot on the sky when you look through them. Basically, they act as a "gunsight" to allow you to accurately aim your scope. Wherever the bullseye points, your telescope does too. For a department-store scope, a red-dot finder will give you a big help for finding objects in the sky. A red-dot finder will cost perhaps $25-$30. As with quality eyepieces, the red-dot finder can be used with any future scopes you might purchase. You can also buy additional mounting brackets for very little cost, and share the finder between telescopes. The mount (tripod, plus the apparatus that holds the telescope tube) in inexpensive scopes is often not very sturdy. Experienced observers know that a sturdy, stable mount is important. Because telescopes use high magnification, any vibration of the scope will be magnified accordingly. This will make it difficult to see objects and focus your telescope. Even expert observers find it difficult to use the mounts supplied with department-store telescopes. Here are some simple techniques you can try to make the mount more stable. Tighten the wing nuts at the top of tripod, where the legs meet the mount head. This will make everything stiffer. Lower the tripod legs. If you can lower the tripod legs, and still reach the eyepiece, this is an easy way to stabilize the scope. The lower the scope is, the less motion can occur. Suspend a weight from the tripod head. Get a gallon milk jug, fill it with water or sand, get a strong cord or rope and hang the jug from the bottom of the mount head. The extra weight will prevent the mount from moving and dampen vibrations. Cut a triangular piece of wood to use as a brace, and wedge it between all three tripod legs just below the tripod head. This brace will stiffen all three tripod legs. You can drill a hole in the middle, to run the cord for your milk jug through. Fill the aluminum legs with sand, lead shot, or foam. This absorbs vibrations, though you will have a heavier mount. Try vibration supression pads. These pads are round rubber discs you place between the ground and the bottom of the tripod legs. 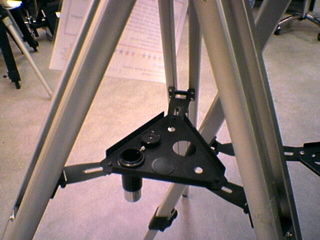 They absorb vibration in the tripod legs. Commercial pads cost about $45-$50, but you may get results cheaply by using three hockey pucks. Attach a chain to the telescope tube. Get a three-foot length of metal chain, with one-inch links, from the hardware or home improvement store. Drape the chain over one end of the telescope tube, and fasten with some duct tape. As the scope jiggles, each link in the chain will absorb a little bit of the vibration and quickly dampen the telescope tube. The companies who market department-store scopes promise you every wonder the Universe has to offer. They claim you will view images in the eyepiece that look like photos from the Hubble Space Telescope. The reality is somewhat different. Department store scopes are typically refractors with very small aperture (lens diameter) compared to more advanced amateur instruments, usually 60 or 70 millimeters. The bigger the aperture, the more light a scope can gather, and the fainter you can see. Unfortunately, a department store scope does not provide satisfying views of most nebulae and galaxies in the sky. Also, keep in mind that no telescope, even very large ones, will give you a view that matches what you see in photos. These photos are taken with cameras set up for hours-long exposures, and use films and CCD detectors much more sensitive than the eye. What you will notice most is that many deep-sky objects such as nebulae and galaxies lack the color you would otherwise notice in a photo. Also, the telescope often does not show things as bright as a photo does. The Moon. The Moon is a fantastic sight in nearly any telescope, and it's incredibly easy to find. It's a good first target for new scope owners, and it's also the subject of serious study and observation amongst many advanced amateurs. The Planets. You can see Mercury, Venus, Mars, Jupiter, and Saturn easily through the scope. You should be able to make out cloud belts on Jupiter, and the rings of Saturn. With some skill and a good chart, you should even be able to pick out Uranus and perhaps Neptune. Double Stars. These stars appear very close to one another in the sky, and the color contrasts can be sometimes breathtaking. The most famous double star is Alberio, in Cygnus the Swan, which appears as a gold and blue gem next to one another in the sky. But there are plenty of other beautiful double stars to see. A small refractor like a department-store scope actually works well for viewing double stars, and at least one serious double star observer actually has used 60-millimeter refractors in their own observing. Open star clusters. These groupings of stars can also be exquisite. You might try observing M36, M37 and M38 in Auriga the Charioteer for starters. (These are all good wintertime objects). M42, The Orion Nebula, in Orion the Hunter. A great wintertime object. M13, The Great Globular Cluster in Hercules. A great summertime object. M31, The Andromeda Galaxy in Andromeda. A great fall object. If these views through your department-store scope whet your appetite, then congratulations! You've made the most of your investment into your new hobby of astronomy, and you're ready for bigger and better views to come.